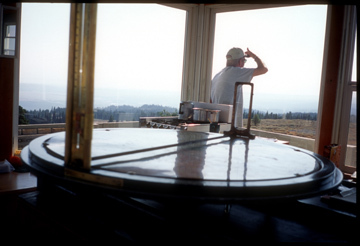 You'll find this "D-6" cupola-style lookout at 7,418 ft. atop Dutchman's Peak in the far southwestern corner of Oregon. It was built in 1927, and stands guard over a wide swatch of the Siskiyou National Forest, and also looks south into the Klamath River drainages in Northern California. The structure is on the National Historic Lookout Register, and is an easy one mile walk off the nearby Pacific Crest Trail (PCT)....Walk a few hundred yards down the west ridge and you'll find a craved wooden headstone marking the grave of the presumed namesake of this peak "The Dutchman," who came looking for gold before 1900.....Botanically, the summit of this mountain is rather unique and interesting, eg. there is sagebrush and curl-leaf Mountain Mahogany (as on the left edge of the image above)..... The Dutchman tower is one of the remaining two or three highest altitude towers in the State. The highest is 8,338 ft. Ireland Mountain Lookout, 35 miles SSW of LaGrande in an interesting historic mining district near Vinegar Hill and Sumpter, in the Blue Mountains. 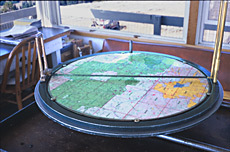 Osborne Firefinder--- here's a picture of the centerpiece of all fire lookout towers for many decades. It is NOT digital and contains no electronics whatsoever! --- The Firefinder was combined with three other key tools to get the job done. Those other three tools were the finder's "map board," a good pair of binoculars (usually 7x50s), and some kind of radio or telephone. Often one can discover old telephone wire or insulators deep in the forests heading downslope from an old lookout tower location. Usually such telephone wire would end at an old Forest Service Guard station or other such location.... Below is lookout Mike Graham on Central Oregon's Mt. Pishgah lookout in 2003. Thank you for the great tour, Mike! 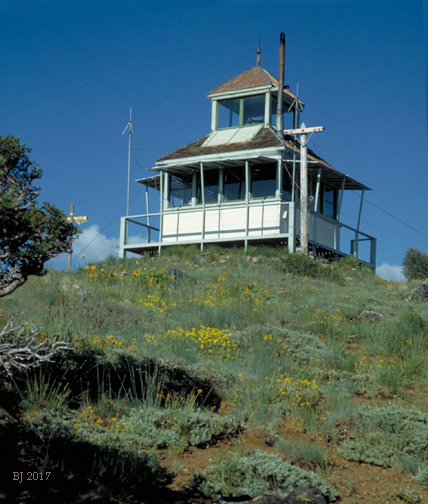 Here is an excerpt from the minutes of the 1995 Forest Fire Lookout Association's Western Meeting in June: "...Ray Kresek closed out the indoor session with a presentation on the evolution of the firefinder and lookout structures. A brief history of the Osborne firefinder was given, with each model on display. Along with handouts, his 100-slide presentation depicted the firefinders used in the West, and various lookout cabin and tower designs of the world. Featured were: trees, from the simplest crow's nest to the 178' tall tree with a 20' tower and cab built in its top near Glouchester, West Australia; the "Guardian of the Gulch", a bell tower still present at Helena, Montana; the first forest lookout (Bertha Hill, ID 1902); one, two, three, and four-legged tower evolution; the first standard cabin design (D-6 cupola 1915); D-1 and D-3 log cupolas; some 30 original and unique designs; the first L-4 (1929), and 1930, 1933, and 1936 variations of the L-4; L-5 cab; L-6 (8' x 8'); and classic, spectacular, and precarious lookouts of the world...." My note: Ray Kresek is the author of at least two excellent books about our Fire Lookout heritage: one is "Fire Lookouts of the Northwest," YeGalleon Press, 1998, 414 big, picturesque pages. Mr. W.B. Osborne was an early Forest Service employee, who also is credited with the invention of a specific kind of panoramic camera that was in heavy use on the mountaintops of the West during the 1930s. Departing Dutchman's Peak, PCT hikers can walk north another forty miles or so on the PCT to another very interesting old lookout site. They will pass alongside Brush Mountain, site of the famed spiral staircase lookout tree..... It's another of the old lookout sites that are on the National Historic Register. Click here to read more. (original image of Dutchman Peak was taken in 1968). Below is a panorama pieced together from three old slides taken in about 1971 from the summit of 8,300 foot Howlock Mountain. Visible to the west is the expanse of Diamond Lake with Mt. Bailey rising above it. In the near distance to the south rises the Matterhorn-like spire of 9,182 foot Mt. Thielson, and beyond that the rim of Crater Lake. Far beyond that in the full resolution image (not shown) one can see the peaks of the Mountain Lakes Wild Area, and of 9500 foot Mt. McLoughlin.